A1A Dock Products 3 Step Lifting Dock Ladder, Standard 2" Steps, Aluminum. FREE SHIPPING! (Picture shown is 5 Step Model with Standard 2" Steps/Treads). 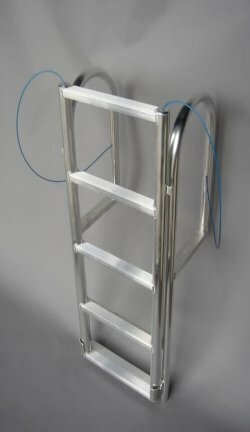 3 Step Lifting Dock Ladder, Standard 2" Step, Aluminum. Ladder is retractable allowing you to pull the steps up and out of the water. This helps reduce marine growth which will increase the longevity of your ladder plus make it safer to climb on. Standard Base Length is 25" (the base is the section attached to the handles where the steps slide along). We also have a Short Base option (select above) which cuts 12" off the base giving you a 14.5" base length. This is ideal for lower profile docks where you can get the entire ladder out of the water. * Please note with the short base option you lose one step. So, if you need 5 feet fully extended choose the 6 step with the short base option (this will give you the short base with 5 feet fully extended). Includes poly coated steel grab wires to assist pulling up the ladder from the extended position.